A striking debut picture book celebrates the creative process. Spread by spread, text identifies “mistakes” in art that give way to inspired new creations. “Even the ink smudges scattered across the sky / look as if they could be leaves— / like they’d always wanted to be lifted up / and carried,” reads text representative of the lyrically ruminative language, and it’s juxtaposed with art depicting just such a scene as a little black child looks up at the smudgy leaves. Twists and turns of the changing compositions will provoke delight in readers examining the pages to see how the white girl with the glasses (which started off as eyes that looked too big) changes, and then how she will fit into the increasingly complex compositions. The evolving black ink, colored pencil, and watercolor pictures seem at once spontaneous and refined against the white space of the page. Careful looking will be rewarded with surprising, often funny details in the art, which invites poring over and will slow down the reading of the spare text. The main character, the bespectacled white girl, is eventually joined by a diverse group of other children who play in and around a festive, fantastic-looking tree, all rendered in a style and palette somewhat reminiscent of Erin E. Stead’s work but distinctive in its own right. An inkblot and a face with an eye that’s too big—are those mistakes? The juxtaposition of mistakes and opportunity is the through line of this original offering that gives children a new way to think about the creative process. Each turn of the oversize, snow-white pages adds a fresh detail to the ink painting slowly being constructed. As the minimal text notes, some are good ideas—the glasses on the character’s face, for instance. Others, like the extra-long neck, not so much. But as the artwork becomes more detailed, and bits of color, then more, are added here and there, it becomes clear that even the unintentional or the unappealing can be turned into embellishments that enhance the whole. Sometimes the mistakes fundamentally change the whole, but if children are open to getting off the beaten path, they can find themselves immersed in magical new endeavors. Luyken, a debut author, delves into her own creative process, providing images to ponder. The final few spreads, especially, can be the springboard for an interesting discussion of imagination. One thing’s for sure: this will lead kids to see their own so-called mistakes in a new, more positive light. "A splash of ink mars the endpapers of "The Book of Mistakes" (Dial, 52 pages, $18.99)— or does it ornament them? In this debut, Corinna Luyken encourages 4-8-year olds to consider how artistic accident can become creative epiphany. She begins with a simple drawing of a girl's face, with one eye too big. "It started with one mistake," she writes. On the next page, the artist compounds the error. Now the girl's other eye is too big. Yet, look! With a dash of green, she adds goggles: "They were a good idea." At once philosophical and imbued with adventurousness...this picture book lifts to the level of the sublime the idea of putting one's slip-ups in perspective." "This is going to be a tough debut to beat as Corinna Luyken has set the bar very high for what is bound to be a new, modern classic. 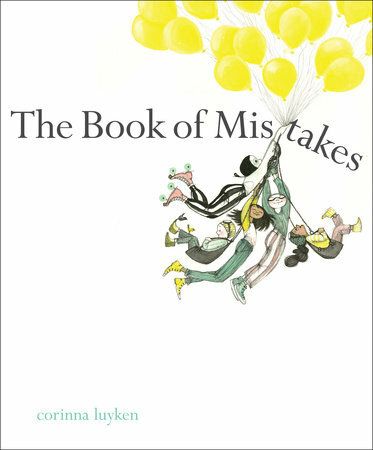 The Book Of Mistakes is a highly original picture book that will resonate with us all in one way or another."